Going on sale is "Stand Up! 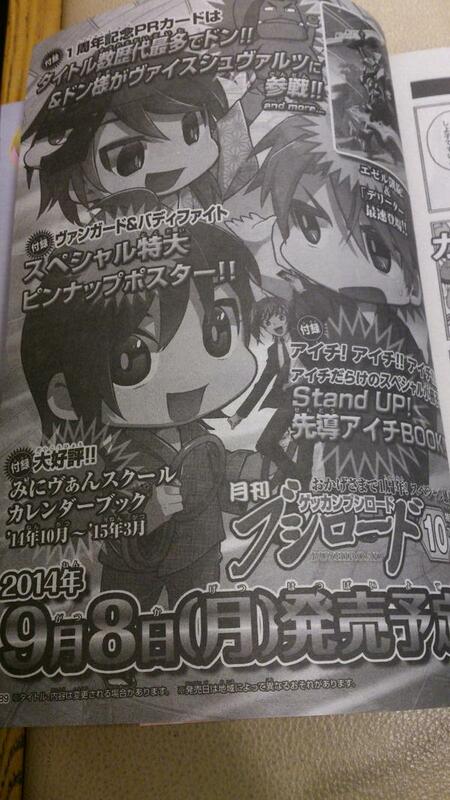 Sendou Aichi" the book, which goes in-depth about Aichi's life and how he fights, just like Kai's book. "Now, it seems that the time of the revolving lantern is at an end." [AUTO](RC):When this unit attacks a vanguard, if your vanguard is in Legion, until end of that battle, this unit gets [Power]+2000 and "[AUTO](RC):[Soul Blast (1)] When this unit's attack hits a vanguard, you may pay the cost. If you do, choose up to two cards from your opponent's bind zone, and put them into his or her drop zone.". "Be hidden, the billion worlds of the universe, Smoking World!" [ACT](VC):[Counter Blast (1) & Choose one card with the same name as a unit on your (VC) from your hand, and discard it] If this unit is in Legion, and the number of cards in your opponent's hand is four or more, choose two cards at random from your opponent's hand, bind them face down, choose one of your opponent's rear-guards, bind it face up, and at the end of that turn, your opponent puts those cards bound by this effect into his or her hand. "The claps of the waves, are all words and laughter. The world is brimming with songs." [CONT](VC): If you have a card named "Super Idol, Riviere" in your soul, this unit gets [Power]+1000. 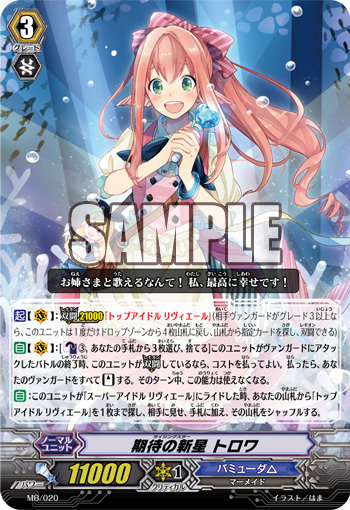 [AUTO](VC):[Counter Blast (2) & Choose a card named "Top Idol, Riviere" from your hand, and discard it] When this unit's attack hits a vanguard, you may pay the cost. if you do, choose up to three of your «Bermuda Triangle» rear-guards, and those units get [Power]+5000 until end of turn. "To think I'll be singing with sister! I'm very, very happy!" [AUTO](VC):[Counter Blast (3) & Choose three cards from your hand, and discard them] At the end of the battle that this unit attacked a vanguard, if this unit is in Legion, you may pay the cost. If you do, [Stand] all of your vanguard. This ability cannot be used for the rest of that turn. 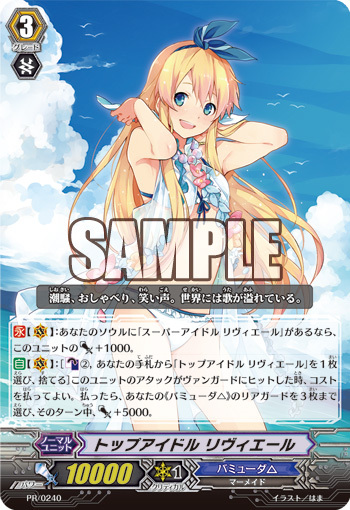 [AUTO](VC):When this unit rides a unit named "Super Idol, Riviere", search your deck for up to one card named "Top Idol, Riviere", reveal it to your opponent, put it into your hand, and shuffle your deck. [AUTO](VC) Limit Break 4 (This ability is active if you have four or more damage)::[Counter Blast(2)]When this unit is placed into VC, you may pay the cost. If you do, retire all rear-guards of all fighters..
[CONT](VC): During your turn, if your opponent doesn't control any rear-guards, this unit gets [Power]+10000. 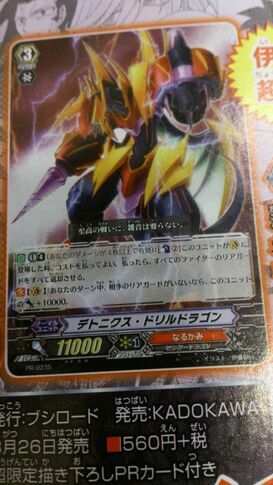 [AUTO](RC):When this unit boosts a «Neo Nectar», if you have a «Neo Nectar» vanguard, and if your deck has been shuffled by your card's effect during that turn, the boosted unit gets [Power]+3000 until end of that battle. 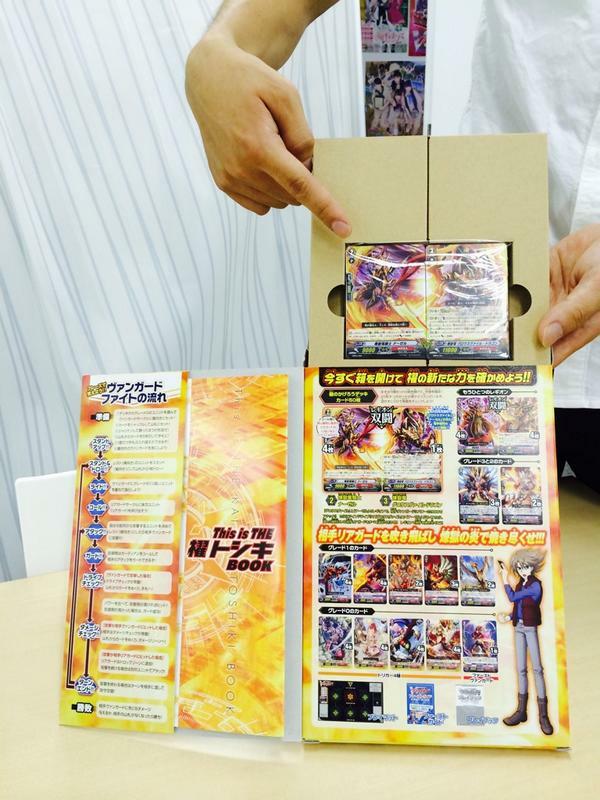 This is THE Kai Toshiki book comes with a deck! 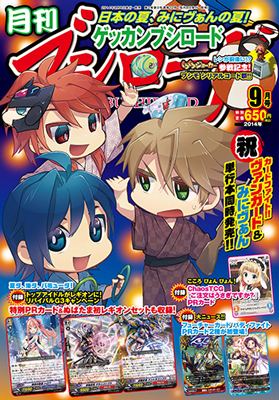 Aichi is controlled by Link Joker. In order to set him free, Neve unleashes a fierce assault against Aichi! Will Neve's sincere feelings reach Aichi!? 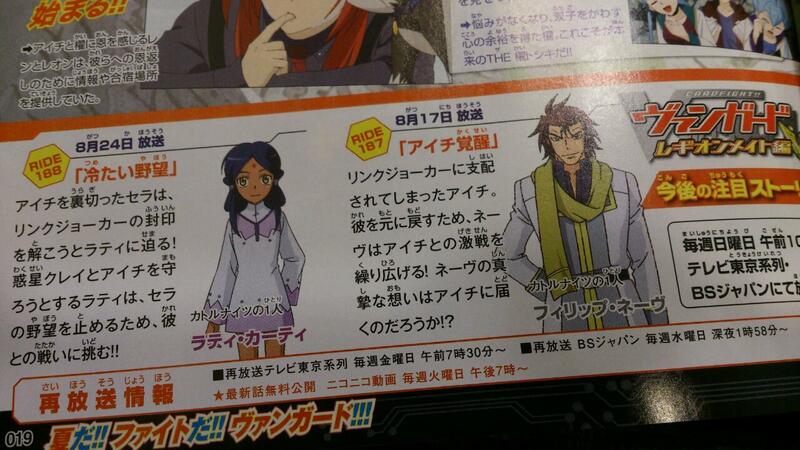 Sera, who betrayed Aichi, approaches Ratie in order to break the seals on Link Joker! In order to protect the planet Cray and Aichi, and to stop Sera's ambition, Ratie decides to fight him! !